This cross of blue stripes forms a letter. 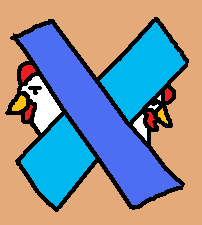 X. is a striking intersection between the ideals of the chickens on either side of it. The cool calculated man on the left and the shady troublesome boy on the right. Together they cross into a powerful duo. I'm sure they have all sorts of Xtreme Adventures together. I imagine I could come up with more if I wasn't limited to the fact that this is an alphabet bit. I'll think about it later.